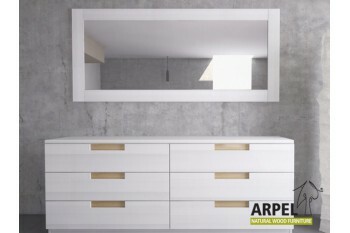 Horizontal or vertical mirror, for wall or drawers support. The Horizontal Luce Mirror has a frame in solid beech wood. With its plain and modern design it makes a perfect accessory for every environment. Choose amongst a wide variety of dimensions and colored finishes to compose a mirror which perfectly matches your furniture. The Vertical Luce Mirror has a frame in solid beech wood. With it's clean and modern lines, it makes a perfect accessory for every interior design. Choose among a wide variety of dimensions and color finishes to compose a mirror which matches perfectly with your furniture.